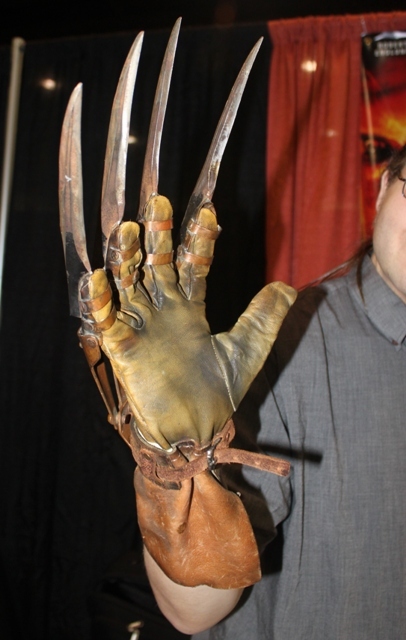 Freddy Krueger’s “Nightmare Gloves” are a cut above the rest! One of the highlights of this year’s ROCK & SHOCK convention in Worcester, MA was meeting and getting to know the artist couple Asia and Anders Eriksen. Asia was covered not too long ago with her amazing creations known as WerePups (you can read all about it HERE). 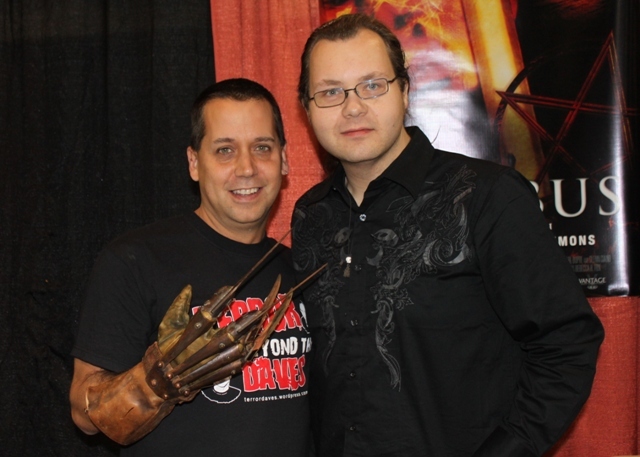 Anders, her husband and an amazing artist in his own right, is the creator of NIGHTMARE GLOVES, the VERY BEST Freddy Krueger gloves available on the market today! Being a collector of masks and props it takes a lot to impress me these days and I will say with all honesty that when it comes to these two, impressive is a perfect adjective! Not only are they amazing artists but they are also very friendly and personable and if you get the opportunity to meet them at a convention, please do not hesitate. You will not be disappointed! Anders and Asia Eriksen (with Toby). I had been in talks with Asia and Anders for months leading up to ROCK & SHOCK about doing blogs on them and both were very excited to be a part of Terror From Beyond The Daves. In fact, I would have to say that these two interviews are among the best I have done to date and I hope you enjoy reading them as much as I enjoyed doing them! So, without further adieu, here is my interview with Anders Eriksen! David: Were you a fan of horror movies growing up? If so, what were some of your favorites? Anders: I have been a fan of horror movies as far back as I can remember, though I’ve been told that The Muppet Show scared me when I was really little. Some of the first horror films that I ever saw were probably FRANKENSTEIN with Boris Karloff, and PSYCHO. 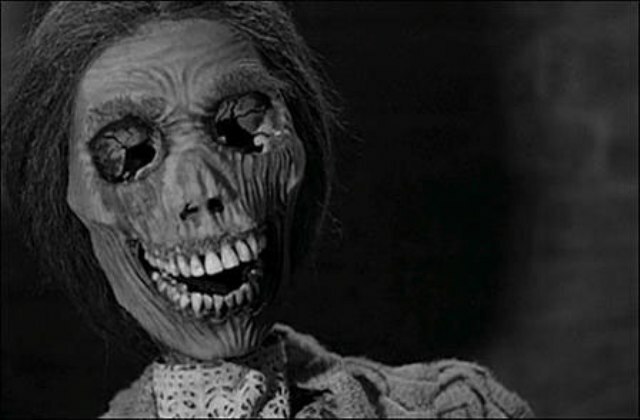 The scene in the fruit cellar when we see Norman Bates’ mother’s mummified corpse made an impression on me then. Also Hitchcock’s THE BIRDS, when a woman had her eye pecked out in a phone booth. I watched the movie again later when I was older, and the scene wasn’t as graphic as I remembered it, but it was the IDEA of the scene had an impact. Sometimes less is more. So I guess, from the beginning the visual shock moments is what stuck with me. Later on, I started watching the Hammer horror films, my brother would record them when they would be playing at night and we’d watch them the next day, or sometimes just stay up late to watch them on TV. It was great, the selection of what you could watch wasnt as diverse, we didn’t have Netflix etc. so you really waited until Friday night, or whenever they would show late night horror films and then you sat through the whole film, even if it wasn’t that great, cause it was all you had, and it was something special. Also, just about every movie with Vincent Price. I’m a huge fan of Vincent Price and his work. He has played some of the most memorable mad men and villains ever, and he is definitely partly to thank for my fascination, and love for “mad scientists”. 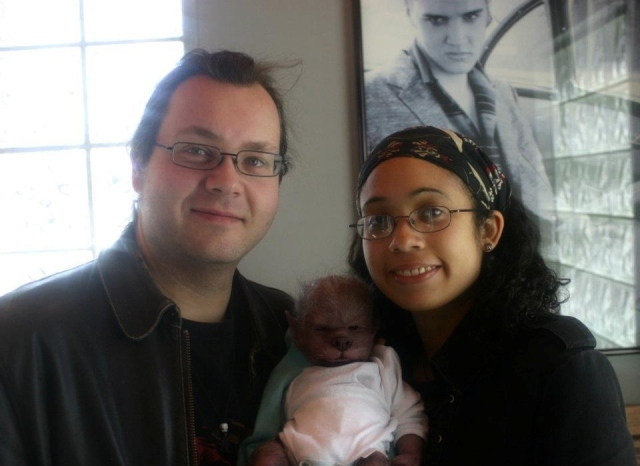 Luckily Asia shares that with me, so much even, that she’s now creating werewolf babies and has a movie in the works, with our very own version of a mad scientist. Glenn Ciano, and Glennergy labs, has taken on this task of bringing all this to life, so it’s very exciting for us. David: Were you always into art growing up? Anders: In one form or another I’m sure. it started with comic books, Sesame Street, The Muppet Show, movies, paintings, books, music. All different forms of art, and they all inspired me in some way or another. I used to draw a lot, and still like to, there are a couple of projects we’re working on, that hopefully will allow me to draw and design more things. I’ve always read a lot, and I’m a huge fan of movies, not just horror. I love a lot of movies from the 70s, they were getting a handle on realism, and some of the best stories were told then. That is something I look for in movies and stories, Believable characters, even if it is an unlikely story, it’s what is real that draws you in. This doesn’t mean I don’t like cheesy movies, I just enjoy them for different reasons, the silly monster, or the bad dialogue etc. they are great entertainment, and it’s just as important for the movie industry to have cheese horrible movies, as well as the great award-winning films. (and honestly, sometimes they can be just as bad). I think horror films can allow themselves to be more artistic than any other genre. It’s also the modern-day version of fairy tales, they often have a morale, and the lead needs to be clever to survive. It’s very symbolic. I also love a lot of classic art, especially atmospheric and impressionistic art. Goya, van Gogh, Caspar David Friedrich, Pieter Bruegel the elder, and Gustave Dore. David: What made you decide to do Nightmare Gloves? Anders: It just sort of happened. After I saw the scene in the first movie where Freddy is building his glove, I just knew I had to build one for myself. I can’t even remember the reasoning, only that I knew I had to make my own glove. The very first finger piece I made was from a curtain rod, paper fasteners and a vegetable knife. After that I think my parents could see I was determined, so instead of discouraging me, they helped me make my first glove. Back then I didn’t know much about how they were built, so we did a research, and eventually hunted down the necessary parts, or alternatives that would work. and I still have that very first glove that my dad built for me using my templates and instructions. I still remember when he had finished the first finger piece. with the blade attached, it was very exciting, and I think he was excited too. It was great. Later on, I wanted to build one by myself, I got the blades for free from a factory, they were discarded blades from a machine they used, and they were really strong blades, they worked great. I managed to find a type of glove that was more similar to the movie used ones, and eventually had a glove I’d built myself. A friend of mine wanted one too, and he liked it so much that he made a website to show it off, and I started getting emails from people asking me if I would make them one. Shortly after the very first Nightmaregloves website was up. This was back in the 90s. over 15 years ago now. Later I upgraded the website so it had a more complete run of gloves, and they looked a lot better! I had that site for a couple of years, and that is when Eriq Chang of Fable Foundry approached me, and wanted to make the new Nightmaregloves site. Of course, he has an amazing visual style, so he took the look and feel of the site to a whole new level. That is almost 9 years ago now. A lot has happened since. David: Did you have any problems selling these initially due to copyright from New Line Cinema? 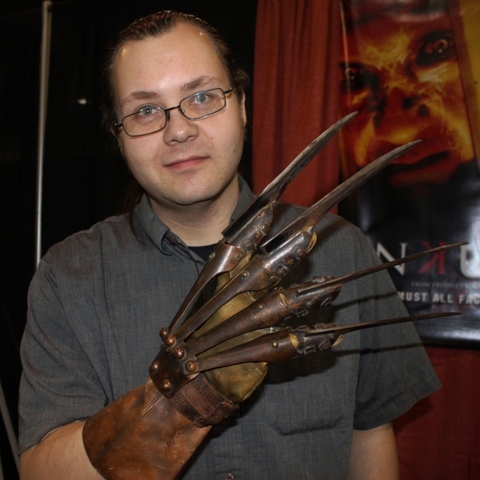 David: Your Nightmare Gloves are the best Freddy gloves available…so good in fact that New Line Cinema did sit up and notice and now want to work with you. How did this come about? Anders: We’re not sure, but I think we’re definitely the most visible on the market, and when you get endorsed by Robert Englund himself, people take notice. And both Robert and his wife Nancy have been very supportive right from the beginning. Nancy Englund even sent me behind the scenes photos just of the glove, so I could make them more accurate. I think they have been a very big part of Nightmaregloves success and I believe I was the only glovemaker who actually placed ads in magazines like Fangoria and Rue Morgue. Nightmaregloves has a solid reputation, and together with the look of the site, we probably look bigger than what we really were with one guy behind a computer and one guy in a workshop. David: These gloves are obviously a labor of love, what goes into making them? Anders: Thanks, a lot of labor does go into making these. I know, some put together a glove in a day or less, by using softer copper, thinner blades etc. but Right from the beginning, I’ve built my gloves, wanting them to be a real live version of what Freddy’s glove would be, perhaps making them a little stronger than the movie used gloves. I started by using solid rivets, tough blades etc. 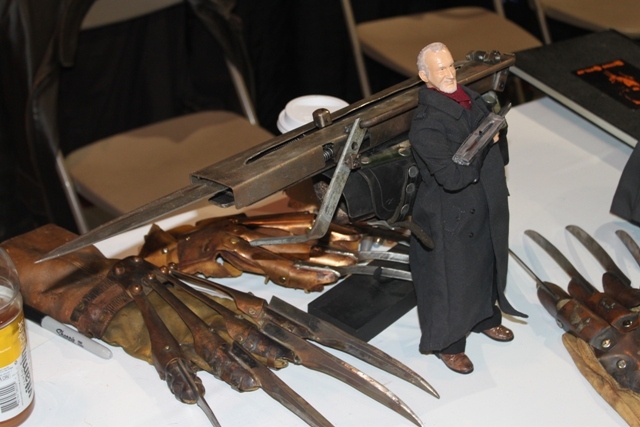 making them a little lighter as years went on, to make them a little bit more like the screen used props, but never forgetting that people need to be able to hold these in their hand, or wearing them and feel like this is what Freddy’s weapon would feel like. Somewhere down the line I got the reputation that my gloves are built like tanks. 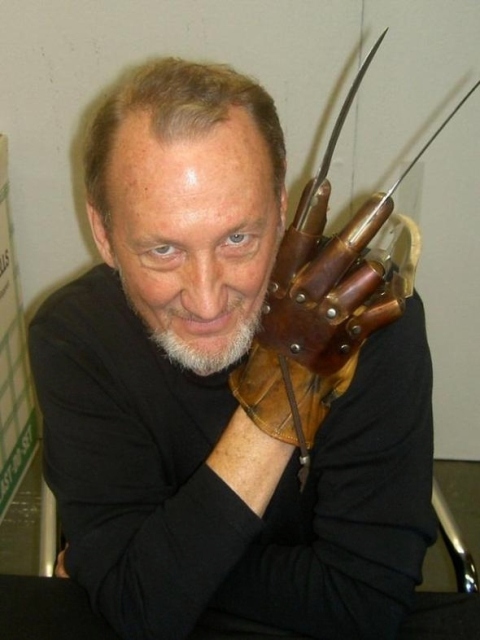 At the same time Robert (Englund) once said he could alway tell when it was one of my gloves as they are the softest on his hands. But all weathering is where I can really put in the detailing, the solder marks, the aging of the copper etc. All that I do by hand still, and it all takes time to be done right. All gloves need to be able to hold up to up close inspection by each customer. 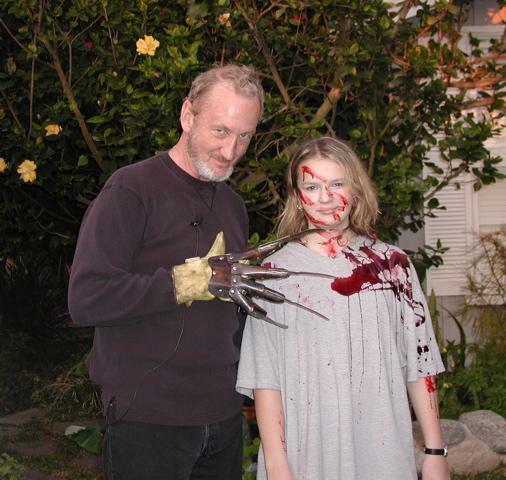 A variety of Nightmaregloves and the weapon used my Robert Englund in the 2011 movie INKUBUS! David: Are these available for sale online or are they only available at convention appearances? Anders: We are relaunching the Nightmaregloves site this month, and there will be certain gloves for sale. We had to focus and just chose a few styles instead of carrying on with the entire collection as before. So, the shows are actually more for show, so people can try on the gloves, and get a feel for which one might suit them best, before ordering on the site. We will always have unique items at our table though, like my own glove designs, other props and of course Asia’s WerePups. David: You are obviously a fan of A NIGHTMARE ON ELM STREET. Which is your favorite movie in the series and why? Anders: It is extremely hard for me to pick just one. I love the original, for a number of different reasons, and it might still be my favorite, but each movie has qualities, that make them all great in their own way. I know one movie that has recently become more popular is the second film FREDDY’S REVENGE. It seems it finally has found its audience. The first one I especially love though because it has that gritty urban legend mixed with children’s nursery rhyme feel to it. Freddy looks and acts, like he might have if he had actually existed. I think that is the key to what makes it scary. David: Have you seen the 2010 remake? If you have, how do you think it was compared to the original? Anders: I think that the original is a modern classic, and don’t think it needed to be remade. we just got Freddy VS Jason a few years ago, so the original Freddy (as portrayed by Robert Englund), is fresh in people’s minds. I also feel that it was probably made for the wrong reasons, and not necessarily by fans of the original films who felt they had something new to bring to the series. David: What was it like to meet Freddy himself, Robert Englund, for the first time? Anders: It was amazing, I had been talking t his wife Nancy online, so she knew who I was and knew of my gloves before I met them. I was absolutely awe-struck. Here was my idol, the main inspiration for me being a fan of the nightmare series, and now inspiration for this new business I was getting into. I still remember, his first line was “ah! our internet friend!” My respect and admiration for both Robert and Nancy has only grown with time, and without their support I’m positive I wouldn’t be where I am today. It’s even thanks to Freddy that I met my wife Asia! I owe a lot to Freddy. Anders and I showing off one of cinema’s greatest weapons ever created! I want to thank both Anders and Asia for their participation in these interviews and for being so open and honest. It is great people like this that make the interview process so easy and fun! Make sure you check out the Nightmaregloves website and support independent artists! This entry was posted in Masks, Models, & Props!, Slasher Movies and tagged A NIGHTMARE ON ELM STREET, Alfred Hitchcock, Anders Eriksen, Asia Eriksen, Eriq Chang, Fable Foundry, Frankenstein, Freddy Krueger, Freddy's Revenge, Nightmare Gloves, Nightmaregloves, Psycho, ROBERT ENGLUND, The Birds, Werepups. Bookmark the permalink. ← Dr. Gangrene’s “Horror Hootenanny” is a Halloween Spectacular! HOW MUCH IS THE FREDDY VS JASON GLOVE?!? They average around $300 but your best bet is to go to their Facebook page (link in the blog) and go from there. You will NOT be disappointed! Anders is the guy I went to years ago for my first Boston Exhibition of my collection and it arrived just in time for opening day in 2005! The hard part was parting with it and putting it on the figure! THEY ARE SO FUN TO WEAR! My Freddy still wears the glove with pride at Count Orlok’s Nightmare Gallery in Salem! Yeah, I just totally plugged shamelessly. Hello im looking for a descent Freddy Krueger glove with razor sharp blades that looks like the one in Freddy vs Jason that doesn’t cost alot all I find are cheap crap or they cost over 100 dollars I Want something in the 70 or 80 $ range can help me pretty please Freddy is my hero……. Unfortunately, when it comes to Freddy gloves, you get what you pay for. The Nightmare Gloves are top of the line and about as close as you’re going to get to the real thing. Because of this they do tend to be more expensive.